Dr. Hrinda has been practicing dentistry for more than twenty years, and he always enjoys helping patients and families become healthier through his work. He achieved his undergraduate degree at Boston University and then spent a year working in Vail, CO before pursuing his doctorate at Tufts University. 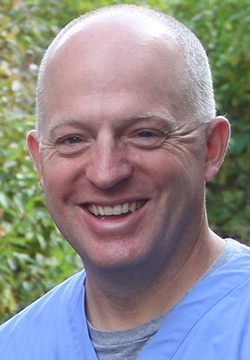 Today, he is a member of several prestigious dental organizations, including the American Dental Association, Massachusetts Dental Association, and the Academy of General Dentistry. Originally from Derry, NH, Dr. Hrinda is married to Dr. Jenna Bagley. Together, they have two wonderful children and a dog. His hobbies outside of the office include skiing and playing golf.